Radiologist Richard F. Rowley, M.D., managing director of St. Peter’s Radiology and treasurer of the board of St. Peter’s Health Partners Medical Associates, has been named the 2015 Physician of the Year by the New York State Society of Physician Assistants (NYSSPA). The society represents the physician assistant profession throughout the state. In winning the award, Rowley joins “an elite group of outstanding physicians who have distinguished themselves among their colleagues,” said NYSSPA President Jennifer Kelly. Rowley will be recognized in October at NYSSPA’s annual fall conference in Tarrytown, N.Y.
A native of Albany, Rowley is an expert in body imaging with a particular interest in musculoskeletal MRI. 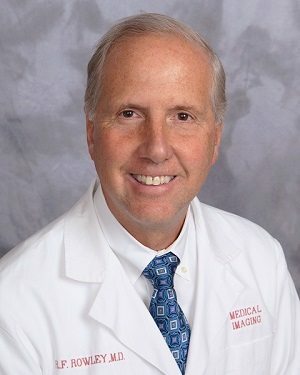 He is board-certified in internal medicine and diagnostic radiology, and served as chief of medical imaging at St. Peter’s Hospital from 1997-2002. Rowley earned his bachelor’s degree from Harvard University, and his M.D. from the Duke University School of Medicine. His residency was at Yale-New Haven Hospital, in New Haven, Conn., where he served as chief resident in both internal medicine and diagnostic radiology.